There are areas of my life that consist of two (or more) very different things intersecting and coexisting. It’s nice to have that dichotomy sometimes, and as I’ve gotten older I’ve noticed that I even tend to seek it out in certain things: music, art projects that I collaborate on, even how I dress on occasion. Artist Matisyahu and his music like to jump and meander between several worlds too. How so? Well, Matisyahu emcees (or raps, depending on how you define it), beat boxes, talks about current issues, has been known to stage dive; yet, he does it all while wearing a yarmulke, often dressed in the dark, conservative clothing of a Hasidic Jewish man, and sporting a full, untrimmed beard. People unfamiliar with him may have a moment of thinking “Wow--what a great gimmick!” when they first see him, but Matisyahu is anything but. It's both intriguing and awesome to see his devoutness meshing so completely with his music and performances. Matisyahu's thoughts and feelings on Judaism often intertwine within his lyrics, but rather than that doing anything to distance music fans who aren't Jewish too, it's the opposite; he packs venues and can bring the crowd to their feet as well as any other popular artist or band out there. Matisyahu's name is actually one that he chose for himself. The thirty two year old artist was born as Matthew Miller in West Chester, Pennsylvania. As a young teenager, he rebelled against his traditional Jewish upbringing, considering himself more of a hippie and a Deadhead. He dropped out of high school and followed the band Phish as they toured, but soon found himself turning back to his Judaic roots. Agreeing with his parents to go to a wilderness school in Oregon after traveling the country, Matisyahu discovered the worlds of hip hop and reggae, and began to participate in open mic competitions. At age nineteen, as he attended school in New York, his musical interest was encouraged at the synagogue he joined. 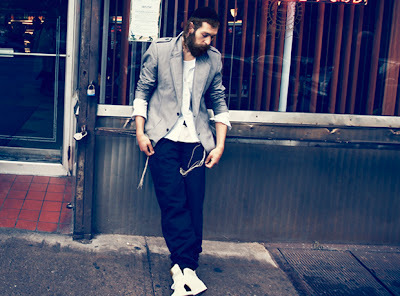 Matisyahu soon met a Lubavitch rabbi, and his interest in the strict Lubavitch Hasidic sect was sparked. It was then that he renamed himself Matisyahu, the name he now uses professionally too. Beginning to perform with a band backing him, Matisyahu and his group recorded “Shake Off the Dust…Arise”, released in 2004, and began touring to support the album. One of the live sets they performed in early 2005 was recorded and released as “Live At Stubbs”, one of his most popular albums. He’s since gone on to record “Youth” (2006), which was nominated for a Grammy as Best Reggae Album, “Light”, and several other live albums (including “Live At Stubbs Vol. 2”). I first discovered Matisyahu when I was flipping through radio stations a few years back, not really paying much attention, only half-listening to see if anything would catch my attention. I was about to keep going on to the next station when I landed on “King Without A Crown”. The reggae beat stopped me, so I paused. Getting caught up in the music and then the lyrics, I kept listening to the end of the song and knew that I had to find out who this was. It was a little bit like my first taste of punk music; what was this weird but thoroughly wonderful new music, and where could I hear more? So I went on a search and discovered that it was an artist with a name that I would have to practice to pronounce correctly, not far from my own age, but with quite a different background than mine. (For the record, phonetically, it's "mah-tiss-yahoo".) It wasn't long before I was hooked on several new songs of his and they earned a consistent rotation on my iPod. The layering of the music is something that I love; each song is a lush story, instrumentally and lyrically. It’s also another reason that I keep seeking out more from Matisyahu. Even with those tunes that I know well, each listening often offers up something new that I didn’t notice before. With this kind of constant discovery, it's no wonder that Matisyahu has garnered a strong following and such loyal fans. I was definitely disappointed to miss his live performance this summer when he was in my corner of Wisconsin, at Summerfest in Milwaukee. Hopefully, there will be more chances in the future though, because thankfully, he doesn't seem to be slowing down any time soon. Check out more Matisyahu! Go visit http://www.matisyahuworld.com/ to watch more videos, find out about his current tour, learn about his band, see photos, download a free song and so much more.